It's time to learn about the Dotes! It may be competitive, but if you want to avoid all the n00b talk, you'll want to practice up in DOTA 2's co-op mode. Here's the skinny. How many players can play DOTA 2 online? Does the PC version of DOTA 2 support split screen play? 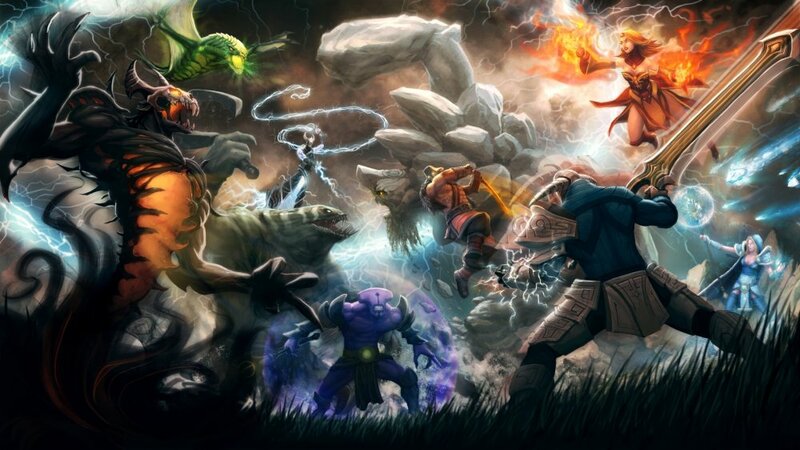 How do you begin a co-op session in DOTA 2? How does save game progress work for co-op play in DOTA 2? Can I trade items or give items to teammates? Can I give money to a teammate? What is the point of levels and “battle experience” for my DOTA 2 profile? Do I get battle experience in co-op games? Does quitting a co-op game negatively affect my player rank? Are there any paywalls in DOTA 2? What are some common setups for co-op teams? What is some common terminology for DOTA 2? 5-player online co-op is supported. In the “lobby” and “practice with bots” co-op options, spare spots can be filled up with friendly bots to assist the players. There is no split screen for DOTA2, one screen per person folks. Three options are available: co-op matchmaking (a full five players will be found to compete against an AI team), creating a private lobby, and practicing with bots. Each game is self contained, so there is no progress other than the experience points that a player earns for their account. Yes, there is in game voice chat. Push to talk is set to \'G\' by default, and it can be switched to voice activated in the options. Can I trade items or give items to team mates? In game items can be traded between heroes, but they can only be sold by the player who purchased the item. This is to avoid giving the carry a huge advantage in the early game. No money can be traded between players while in game. Mostly prestige. Whenever players level up, they will be guaranteed a cosmetic/vanity item of a random rarity. Queued co-op battles will give all players experience, whereas practice bot matches will not give any experience. If you drop from a queued co-op game, it will count against your record and will be noted as an “abandoned” game. This is a bad thing not only because it hurts the experience for other players, but if done too many times, will also put you in a pool with other players that abandon games. All heroes are unlocked by default, but cosmetic/vanity items are purchasable with real money via the DOTA 2 store. The currency is money in your Steam wallet. These cosmetic and vanity items have no effect on gameplay. Playing matchmade games have a chance to drop a cosmetic/vanity item, and players are guaranteed an item when they level up. These are random items, however. Heroes are split up into three main categories: Carry - late game heroes that are weak at the beginning but become very powerful towards the end of the match. Support - heroes that are best at helping team mates and require levels rather than gold to be effective. Ganker - heroes that accel at killing other heroes. A good team composition will have two supports, a ganker, a semi-carry, and a carry. This is not set in stone, but ensures that you have a balanced lineup. Another rule of thumb is that you do not want to have two melee heroes in the same lane, as this makes it easy for the other team to harass you and is very difficult to be effective in lane together. Feeding - This means you are giving kills to the other team. Don't worry, it happens. Just do your best to avoid making yourself available for easy kills. Roaming - Moving around the map, usually looking for blood. Ganking - Moving out of lane to kill an enemy hero. Pushing - Being aggressive (usually as a team) to try and take down an enemy tower. TP - Town Portal (scroll), also means to teleport to a location. Creep(s) - The small units that mindlessly push down the lane, allied with either Radiant or Dire side. Neutral(s) - The killable, non-allied units that are outside of the lanes. Jungle/Woods - The areas between the lanes which contain neutrals. Page created in 0.5630 seconds.